Bhutan is known by various names. In the past, the country was widely known as Mon Yul or the Land of Darkness. The other names given were Lho Jong Men Jong or the Southern Land of Medicinal Herbs, Ridag gi yul or the Land of dense forests and mountainous terrain. Today, we are known as Bhutan to the international community. Bhutan is situated in the eastern Himalayas. To the north, it borders the Autonomous Region of Tibet, China and to its South, the Democratic Republic of India. Bhutan is a mountainous country except for a small flat strip in its southern foothills that borders the two Indian states of Assam and West Bengal. High steep valleys and deep gorges are normal features of Bhutan. Bhutanese really pride their rich culture and tradition that is not only unique but being preserved. Our rich culture and traditions have really blended well with modernization and development. Preserving the culture has also been recognized as one of the main pillars in fulfilling the overall development philosophy of Gross National Happiness. Tourism in Bhutan was initiated by the forth King His Majesty Jigme Singye Wangchuck at the time of his coronation. Today, the Tourism Council of Bhutan is the regulatory authority which is an autonomous body. There is a strong policy in place which that advocates high value, low impact/volume tourism. The number of tourist visiting the country has been increasing steadily over the years. Bhutan has four particular seasons and each season has its own particular magnificence and appeal. Bhutan is a year-round goal. In this way, it is completely up to you to choose your trip to Bhutan period. Spring is a botanist’s joy as different blossoms begin and plants begin sprouting after their long torpidity in winter. Blooms, for example, rhododendron, wild azaleas, and edelweiss cover the glades like cover and include another feeling of ponder to the Bhutan’s scene. This season is a time of hot and wet climatic condition with high precipitation in many parts of the nation. It is a bounteous time as blossoms are in full sprout and valleys are canvassed in green. This is the time when the whole scene transforms into brilliant shading. The agriculturists gathering their products in the brilliant shaded paddy fields under the fresh blue skies is only a stunning perspective of Bhutan’s scene in the Autumn season. These months encounter chilly and dry climatic conditions. Be that as it may, the crisp winter season in Bhutan gives one a reasonable perspective of the world’s most noteworthy Himalayan mountain ranges canvassed in snow. Road or by Air is the only way how to reach Bhutan. Getting to Bhutan is either by Road or by Flight. Entry to Bhutan by road can be made only from Phuntsholing , Samdrupjongkhar and Gelephu. West Bengal (Jaigaon) border is the favored one for the individuals who wish to take a road trip to Bhutan. The Entry gate at Phuntsholing remains open from 7 Am (BST) till 10 Pm. 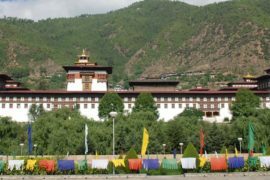 For any tourist making a trip to Bhutan must first visit to immigration office to complete registration and then proceed further continuing your daily tour itinerary. How to Reach Bhutan by Flight? Paro International Airport is the only Airpoprt in Bhutan that connects Bhutan to the outer world. 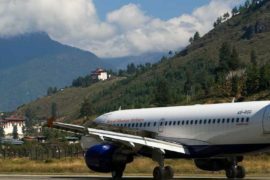 Bhutan only has two domestic airports at Gelephu and Bumthang as for now. Reaching Bhutan by Flight has now become much easier compared to before. More destinations has been added up to make ease for tourist visiting Bhutan. 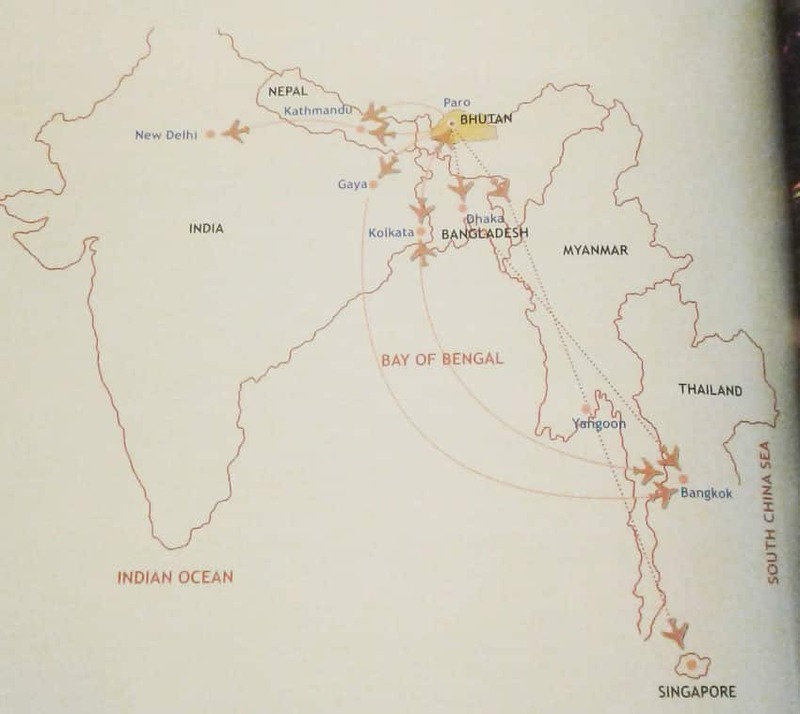 Bhutan currently has two major Airlines, Bhutan Airlines and Drukair. For any international tourist visiting Bhutan must produce Bhutan Tourist Visa at the entry point to Immigration Officer. Prior to your trip to Bhutan, Bhutan Visa must be processed through any of the local Bhutanese tour operator. Bhutan Tourist Visa is approved in advance and will take up to seven working days excluding Saturday and Sunday’s. Flights tickets for tourist cannot be booked without valid visa clearance certificate. One time visa processing fee of USD 40 has to be paid separately excluding Bhutan tour cost. A scanned copy of original passport valid for 6 months has to be send to the local Bhutanese tour operator to process your visa. 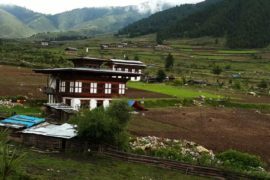 There are numerous important tourist attractions in Bhutan ranging from 16th century monuments and even older than that which makes Bhutan as true iconic structure in the world. Some myths of Terton Pema Lingpa even take us back to 14th century. The main historic tourism attractions in Bhutan highlights Tiger’s Nest, Punakha Dzong, Wolrd’s tallest sitting Buddha, Chimi Lhakhag (Devine Madman’s Temple), Ta Dzong (National Museum of Bhutan), Rinpung Dzong and Trashicho Dzong. The Tourism Council of Bhutan plays important roles of which they plan and update important national policies. Develop and implement tourism guidelines and put in place measures, carry out marketing and promotional activities and develop new products and services besides facilitating man power and skills requirements in the tourism sector. The only airstrip in Bhutan is located at Paro. Paro Valley is one of the most populated areas of the whole country because of it’s proximity to the airport. The valley of Paro contains a wealth of attractions and requires a few days to explore properly. Casting a shadow across the town of Paro and controlling all secular and religious activities in its valley is the Rinpung Dzong built in 1645. Behind Rinpung Dzong, on the top high hillside, is the castle-shaped ta Dzong. Onetime watch tower built to defend during the civil wars of the 17th century. Ta Dzong has housed the nation’s heritage in Bhutan’s National Museum since 1967. From a Buddhist’s point of view, Paro was the first stop for Guru Rimpoche on his crusade from Tibet to Bhutan over one thousand years ago. 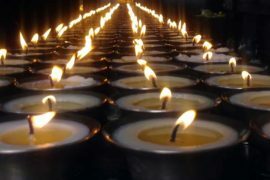 Taktshang monastery is now a scared shrine for all visitors who travel to Bhutan from all over the world to pray at its temple. Eighten Kilometers from Paro town on the south side of the valley are the burnt ruins of Drukgyel Dzong. It was from this monastery that the Bhutanese repelled several invading Tibetans armies during the 17th century. Thimphu is the capital of Bhutan. 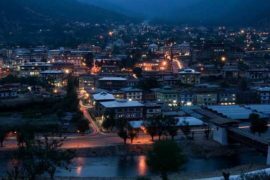 A regal town, Thimphu is home to the revered Bhutanese Royal family and to several foreign missions and development projects. On the bank of the river lies Tashicho Dzong, the main secretariat building which houses the throne room of His Majesty the King of Bhutan. The national Assembly Hall is housed in a modern building on the other side of the river from the Dzong. Visitors are strictly prohibited from entering the government building at all during an active session. Bhutan’s National Library is located clsode to the painting school and is also worth a look in. Housed in the library are some of the oldest records of Bhutanese history and religion. A wonderful day’s outing from Thimphu is a visit to Cheri and Tango Monasteries to the north of the town. They can be reached by road but many tourists go up to the monasteries for a daytrip by foot. Five miles from Thimphu stands the 17th century Simtokha Dzong in the land houses the school for Buddhist studies. Punakha lies about two hour’s driver from Dochula down low in its valley from Thimphu. Punakha Dzong is home to the central monk body and the Je Khenpop during the milder winter months. A temperature climate and natural drainage from Pochu (male) and Mochu (Female) rivers, the fertile Punakha valley produces abundant crops. Punakha severed as the capital f Bhutan until 1995. Punakha Dzong was strategically built at the junction of the two rivers in the 17th century by the frst Zhabdrung to serve as the religious and administrative center. Chimi Lhakhang (Devine Madman) where all people of world visit this lhakhang for child. There are many true stories how childless parents got their child through prayers and ceremonies visiting Chimi Lhakhang. The minimum Bhutan travel cost of USD $200 per individual every night for the months of January, February, June, July, August, and December. The minimum Bhutan travel cost of USD $225 per individual every night for the months of March, April, May, September, October, and November. These rates are appropriate per traveler every night stop in Bhutan. The Royal Government of Bhutan sets least pitching costs for bundles to Bhutan. These must be paid in US dollars preceding landing in Bhutan. The minimum daily Bhutan trip package Includes the following services. The minimum daily Bhutan trip package Excludes the following services. The atmosphere in Bhutan is very distinct compared to other parts of the globe. The difference of the climate conditions in Bhutan follows two principle factors, the huge contrasts in elevation display in the nation and the impact of the northern Indian rainstorm. Southern Bhutan has a hot, sticky sub-tropical atmosphere that is genuinely perpetual consistently. Temperatures can fluctuate between 15-30 degrees Celsius. In the Central parts of the nation the atmosphere cools somewhat, changing to calm and deciduous woodlands with warm summers and cool, dry winters. In the far Northern Bhutan the climate is cool amid winter. Mountain crests are unendingly shrouded in snow and lower parts are as yet cool in summer inferable from the high elevation territory. Thimphu encounters dry winter months (December to February) and no precipitation until March. Bhutan’s dry spring begins towards beginning of March and continues until mid-April. Summer climate begins with intermittent showers and proceeds to late June. The heavier summer rains last from late June through late September. Pre-winter, from late September or early October to late November, takes after the stormy season. It is described by splendid, bright days and some early snowfalls at higher rises. From late November until March, winter sets in, with ice all through a significant part of the nation and snowfall basic above heights of 3,000 meters.